This beautifully illustrated volume provides all the information you need to get started, from plant choice advice to care requirements and bonsai "carving" tips. Suitable for indoor gardening, or shaping exquisite bonsai fruit trees for outside gardens, Bender turns a finicky art into a hobby accessible to all. 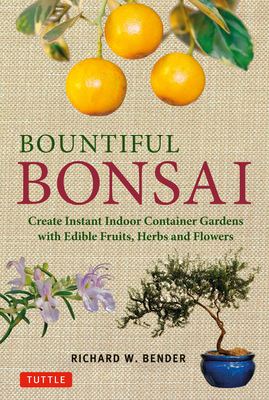 Bonsai have graced Japanese homes for centuries; now they can yield useful crops that will simultaneously satisfy your artistic sensibility and also provide some wonderful meals. Richard W. Bender was born in St. Louis, MO and grew up with an Ozark rural lifestyle. The combination of a rural life connected to nature and the cultural advantages of attending a large high school provided a unique perspective that is reflected in his writings for several newspapers and magazines including Horticulture, Field & Stream and The Herbal Companion. After graduating from the University of Missouri-Columbia with a B.S. in fisheries and wildlife management and two years in neuroscience grad school, he moved to Colorado in 1985, where he has operated Bonsai By Bender for 20 years, supplying unique bonsai to clients like the Missouri Botanic Gardens, Franklin Park Conservatory (Columbus, OH, ) Portland (OR) Classical Chinese Garden and the COMO Park Conservatory in St. Paul, MN. His first book, Herbal Bonsai was in print for 15 years.